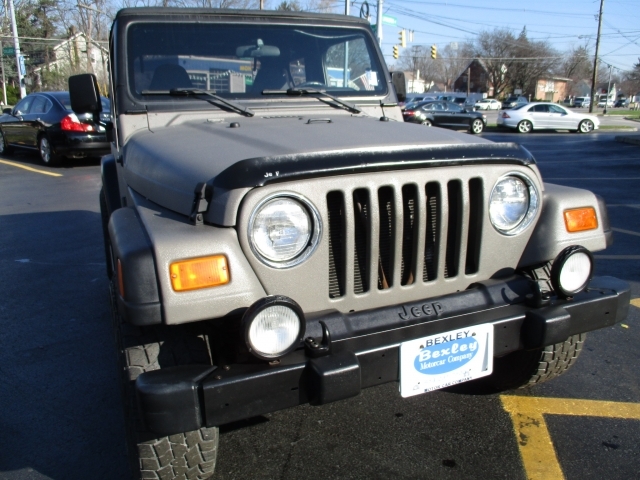 The 2002 Jeep Wrangler Sport | Bexley Motorcar Co.
Bexley Motor Cars is proud to offer this 2002 Jeep Wrangler for sale. This Wrangler has one feature you don't see every day. That would be the Rhino Lined exterior. This is fast becoming a major upgrade to Wranglers and other off road cars. This keeps the exterior of this Jeep Wrangler free of rust and scratched free. This is the same type of lining of that people use in their beds of their work trucks. This Jeep has the legendary 4.0L 6cyl engine that is the most sought after engine in this generation of Wrangler. Match that with a automatic transmission and Four wheel drive you can drive over, under,around, or through any thing the road has in store for you. Moving inside you will see an upgraded factory radio and cruise control. This Jeep is a show stopper. Stop by Bexley Motor Car Company to see what this Wrangler Sport has to offer.